NASA video about the final moments of the Cassini Saturn probe. An artist’s view of Cassini at Saturn. Not long ago I wrote that the mission of the fantastic space probe Cassini is coming to an end. On Sept. 15, 2017, after a series of quite daring maneuvers, Cassini will drop into the atmosphere of Saturn, returning a last few bits of data about the giant planet’s atmosphere even as it plunges to its death. This is bittersweet, to be sure. 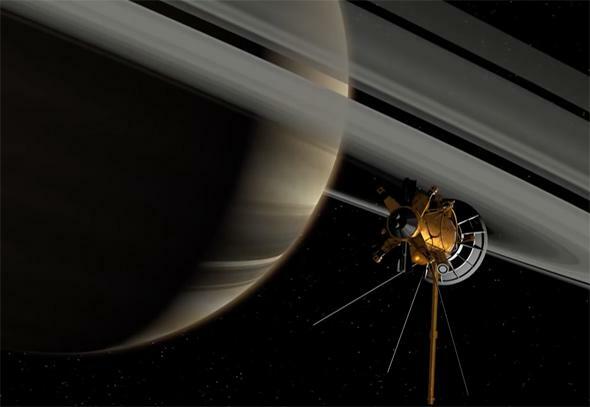 Of all the robotic probes humanity has sent into space, Cassini is one of my favorites. It’s been orbiting Saturn for more than 12 years; I remember watching the live feed of the orbital insertion burn with my daughter, then in grade school, while she asked me questions about it. My daughter is now in college. That puts the longevity of Cassini into perspective. But all good things … It costs money to maintain a spacecraft mission, and NASA has a limited amount of it. The longer the mission runs, the higher the chance something will go wrong, or it will run out of propellant—and Cassini’s tank runs low. NASA wants to make sure the probe cannot hit any of the moons; while it’s unlikely in the extreme, we don’t want our germs contaminating any places where there might be life. And this way we get extra data about Saturn’s atmosphere, too. I always hate to see a mission end, but there is something noble and hopeful that our robotic proxy will send us information back even with its last breath. May all such missions do so well.